The Human Whack a Mole inflatable game is THE big hit of 2018 and something completely new to the market - you've probably seen the videos on social media that hit over 40million views in just a couple of weeks. Lichfield Entertainments have this great new entertainment available to hire now so get booking! Human Whack a Mole is a game for up to six players plus the central player - the 'gardener' with the hammer. Games are fast and furious with the human moles trying to grab as many balls from around the central position as possible within a set time while avoiding being whacked by the hammer. The Human Mole with the most balls at the end is the winner. This game is for players 4ft 10in and taller - any shorter and they won't be able stick out of the 'mole hole' to reach the balls. For outdoor events we can provide an inflatable weather shelter but this increases the space required to 24x24ft. 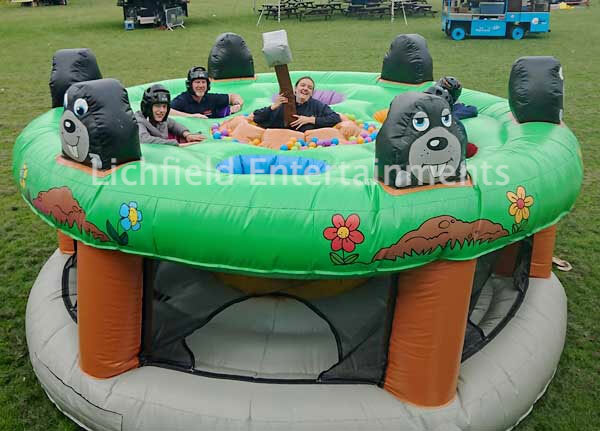 If you have any queries, questions, or would like to book the Human Whack a Mole game for your event please click here to enquire and we will be happy to provide a no obligation quote.